Doors swing and bang, floorboards creak and the tin roofs on the old worn wooden buildings rattle. 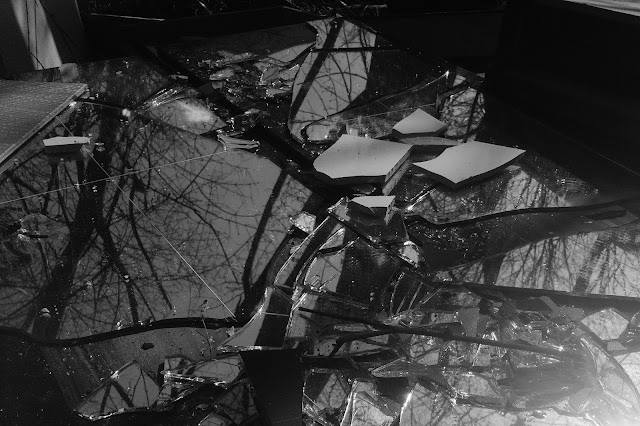 The wind swishes through the dusty streets, through the broken-glass windows, through the houses' unfurnished rooms to the dusty streets on the other side. Nothing else stirs, nothing else moves, 'cept a lonely lizard who scampered from a rusty pole behind a pile of wooden beams discarded outside. The market was empty, no produce on display, no merchants crying their wares, no haggling shoppers, no hustle or bustle. No actors on stage at the theatre, no audience to applaud them; no guests at the hotel, no staff to serve them; no children at the school nor teachers to teach them. 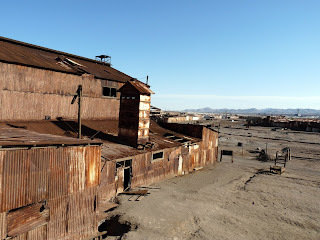 Not one human did I see in Humberstone, a tidy ghost town abandoned to the elements around 50 years ago after the collapse of the Chilean nitrates (fertiliser) mining industry. Everyone long gone, leaving this desert town deserted in more ways than one. I made my way up to the old factory behind it, a huge chimney protruding up like a beacon calling for attention. It had been a long time since it got any attention, huge metal workshops all rusty now, creaking, groaning and banging in the wind. Bang! 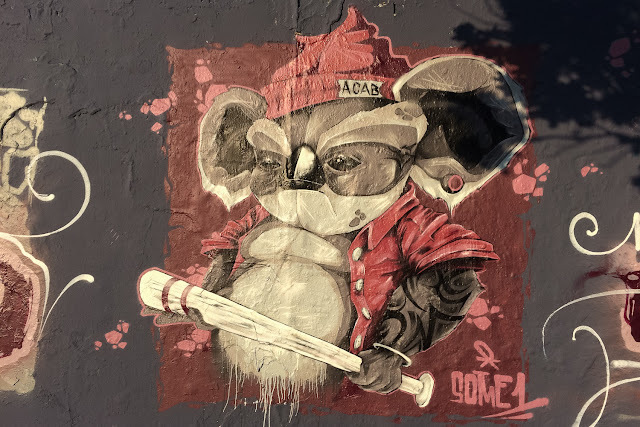 Bang bang! 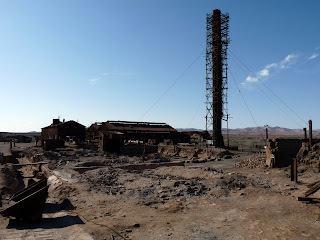 Big wheels and old conveyor belts, all rusted to immobility, chimneys poking up no longer with a purpose. Old steam locomotives lay scattered around the yard outside, great hulking masses left to rust and rot under the merciless sun. The wind whistled and howled through gaps in the wall, banging the sheets of corrugated iron above my head. But nothing else could I hear, no life at all, not even a bird dared chirp in this forsaken place. What ghosts still roamed the factory floor? What spirits its houses? What tales and stories would too be forgotten after Humberstone's residents suddenly turned their backs on their town? It's all the Germans' fault actually, for inventing the process of making nitrates, rendering the need to import it from Chile obsolete. 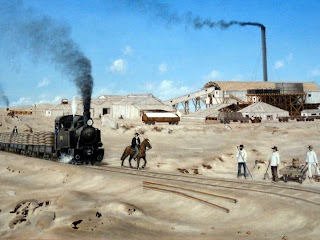 In one fell swoop, Chile lost its main export commodity, and workers in 170 desert mining towns suddenly found themselves out of work. 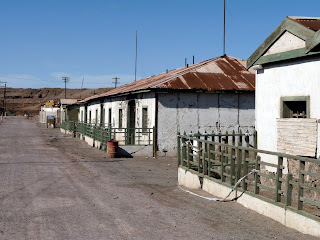 Humberstone was just one of those towns, all subsequently abandoned as their residents went looking for other work. Jenny showed no remorse at all when I told her what her fellow countrymen had done. She wasn't even aware of it! "Oh no, they don't teach you that stuff in school!" I told her. But still she showed no pity for the poor old Chileans' plight (Bolivians and Peruvians too). "If Germany hadn't invented it, you wouldn't have had anything to do, nothing to look at," she replied. I guess she has a point. 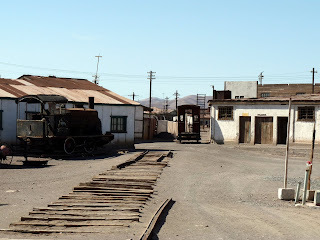 Ghost towns sure are more interesting than mining towns. very good writing! aliterations, puns and modernistic literary effects; very nice!